Now that we know what causes tongue thrust, how to prevent, and how to remediate tongue thrust, its time to review how to perform a tongue thrust assessment. 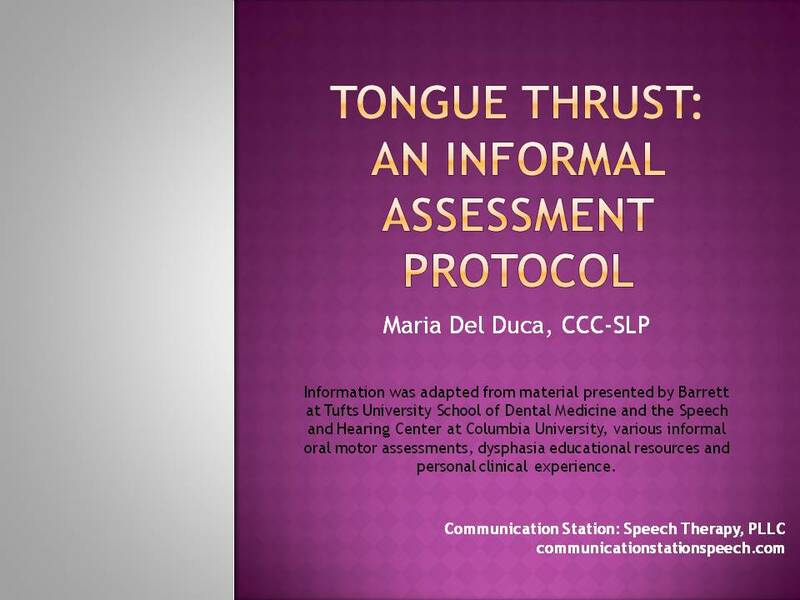 I want to make it clear that the below PowerPoint explanation of tongue thrust assessment and the assessment protocol are INFORMAL in nature, not standardized, and have been created based mainly on my personal research and clinical experiences over the years. Information below is NOT for commercial use or redistribution. For personal use only! Communication Station: Speech Therapy, PLLC retains the creative rights to all materials made on communicationstationspeech.com. Here is a more in depth explanation of what we as SLPs should be looking for when we are assessing possible tongue thrust. I created an assessment protocol based on the information I currently know about tongue thrust and typical development. Feel free to use it if it works for you but remember to give credit back to this blog and refer colleagues here for their copy. You may NOT reproduce ANY PART or ALL of the information from this blog for commercial use or to present or sell as your own! Want your own copy of this tongue thrust assessment? Grab it here! Tongue Thrust: A Remediation Program!